Perfect for sharing over coffee – this bundt cake is a decadent mix of chocolate and Baileys with a sweet and salty kick. Heat oven to 170ºC/fan150ºC/gas 3. Using the 2 tbsp of butter, grease a 2.4 litre bundt tin so it’s completely coated. Melt the chocolate in a glass bowl set over a simmering pot of water, making sure the bottom doesn’t touch the water. Alternatively you microwave it for 30 secs at a time until melted. Remove from the heat and add in the cocoa, vanilla, sour cream and 75ml hot water and whisk until smooth. In another bowl whisk together the flour, baking powder, bicarbonate of soda and salt. In a standing electric mixer beat the butter with the sugar until fluffy. Add the eggs, one a time, then beat for 3 mins until thick and full. Stir in the chocolate sour cream mixture, then add the flour mixture. Mix again and then scrape into the bundt tin. Bake for 45-50 mins or until a skewer comes out clean. Remove from oven and leave to cool for 15 mins. Place a wire cooling rack over the top and flip over. Leave to cool completely. To make the Baileys salted caramel sauce, put all the ingredients into a large frying pan and heat until bubbling, about 5 mins. 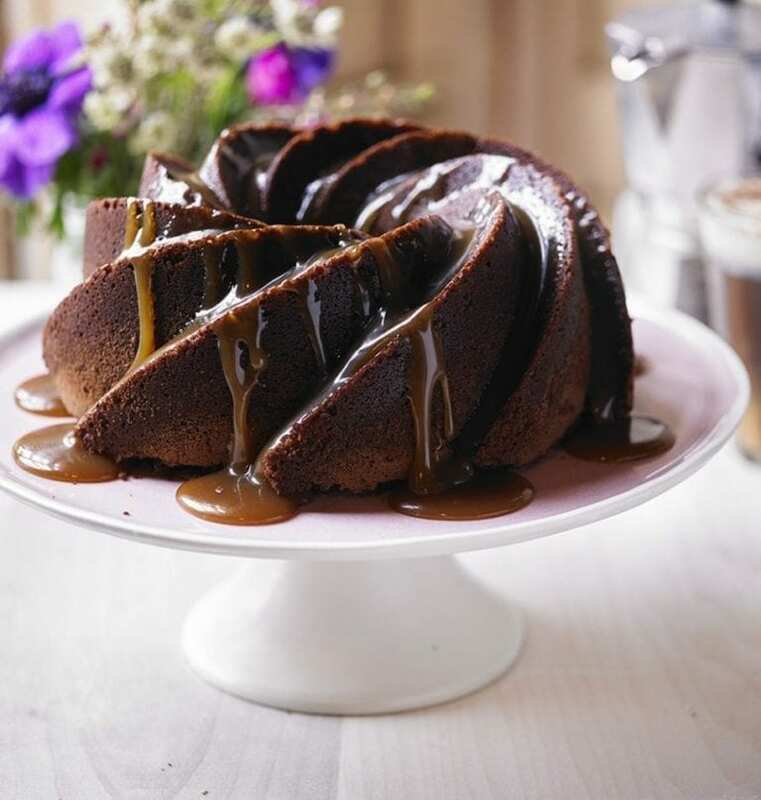 Serve the cake with the caramel sauce poured over the top. For more indulgent Baileys recipes, click here.